Peter Enns. The Bible Tells Me So: Why Defending Scripture Has Made Us Unable to Read It. New York, NY: HarperCollins, 2014. 288 pp. $25.99. I confess that I do judge books by their covers. Or at least by the back cover. I read (and review) a lot of books and am always careful to read the endorsements on the back and the description on the inside flap. Although endorsements aren’t everything (and are sometimes even misleading), they can reveal quite a bit about where a book is headed. That’s their purpose anyway. 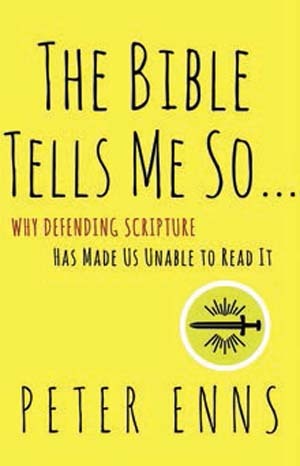 In this case of Peter Enns’s new volume, The Bible Tells Me So: Why Defending Scripture Has Made Us Unable to Read It, the endorsements (and endorsers) reveal quite a bit. One will find blurbs by Rob Bell, Rachel Held Evans, and Brian McLaren, among others. Interestingly, Tony Campolo also offers one but with the caveat that, “As an old-fashioned evangelical, I have some problems with what he has written.” Given that Campolo is by no means a conservative fundamentalist, his statement does an admirable job preparing the reader for what’s coming. Not until after I read the book in its entirety did I realize how accurate this comparison actually is. Of course, Bell’s book (also published by HarperOne) challenged a core historical tenet of the Christian faith, namely the belief that hell is real and people actually will go there. Christianity has just been wrong, Bell argues, and we finally need to be set free from the fear and oppression such a belief causes. Bell positions himself as the liberator of countless Christians who have suffered far too long under such a barbaric belief system. Likewise, Enns is pushing back against another core historical tenet of the Christian faith: our belief about Scripture—what it is and what it does. The Bible isn’t doing what we think it’s doing, he argues. It doesn’t provide basically reliable historical accounts (instead, it’s often filled with myth and rewritten stories). It doesn’t provide consistent theological instruction (about, say, the character of God). And it doesn’t provide clear teaching about how to live (ethics, morality, Christian living). Although Christians have generally always believed these things about Scripture, Enns contends that scholars now know they simply aren’t true. And when Christians try to hold onto such beliefs, it only leads to fear, stress, anxiety, and infighting. Like Bell, Enns is positioned as a liberator able to set believers free from a Bible that just doesn’t work the way they want it to. Of course, Enns, professor of biblical studies at Eastern University in St. Davids, Pennsylvania, isn’t the first to make such arguments. In addition to following Bell’s modus operandi (and much of his writing style), Enns relies on standard arguments from Christianity’s critics over the years. There’s little new here, academically speaking. In many ways, portions of the book sound like Richard Dawkins (especially part one) and even Bart Ehrman (especially part two). But here’s what makes Enns different. When it comes to the death and resurrection of Jesus, Enns doesn’t follow either. He affirms the resurrection of Christ and, in a broad sense, affirms that Jesus gave his life on the cross as “a sacrifice for sins” (217). Enns’s case for why we should change our view of Scripture is divided into three parts: (1) the Old Testament (OT) God is portrayed as a genocidal tribal deity; (2) the Bible’s historical accounts aren’t, well, historical; and (3) its ethical commands are confused and contradictory. I’ll touch on each of these three claims below. In chapter two, Enns makes the standard Richard Dawkins-style case that the God of the OT is a genocidal maniac who enjoys killing women and children (and, in the flood, just about every living thing on the planet). All standard evangelical attempts to explain God’s behavior aren’t going to cut it either. Enns even draws a comparison between the killing of the Canaanites and the colonization of the Americas when indigenous populations of the West Indies were wiped out (in the name of God, of course). Those looking for a good argument against Columbus Day will find it here. But don’t fear, Enns says, because all of this isn’t really a problem once you understand one simple fact: the real God didn’t do any these things; the Israelites just said he did (61). The OT narratives are just the standard polemic of ancient tribal people who didn’t know any other way to describe their God. “[The Israelites] had no choice,” Enns writes. “That’s just how it was done—that was their cultural language. . . . God lets his children tell the story” (63). Problem solved. Or is it? The Canaanite conquest certainly presents some difficulties, but Enns’s solution creates even more. I will offer just three observations. (1) First, an observation about ethics. Enns goes to great lengths to highlight the moral reprehensibility of the Canaanite conquest (and I mean great lengths). But what ethical standard is he appealing to as he makes his case? On what basis is he calling this conquest morally reprehensible? Later, Enns argues that you can’t use the Bible as an “instruction manual” (134) or a “rule book” (repeated ad infinitum) on how to live life since it contains contradictory moral commands about all sorts of things. The Bible isn’t designed to “tell me what to do” (135) because it is “so utterly disinterested in giving straight answers” (135). If so, then Enns finds himself in a dilemma. He either claims to get his moral norms from some other source (what is this mysterious source? ), or he must claim to get them from Scripture. But if he gets them from Scripture, one might wonder why all his statements about how Scripture is unclear about ethical norms don’t apply to him too. I suppose Enns could say he doesn’t need to justify why “genocide” is wrong—it’s just obvious to everyone (which is also Dawkins’s argument). But why should Enns get a philosophical “pass” on such a fundamental issue like the foundation for ethics, especially if his main argument is an ethical one? One other possibility is that Enns could argue the Bible’s ethics are only confused some of the time, but when it comes to things like murder, it’s clear. But, of course, that’s begging the very question at hand. If God himself is going around murdering people (as Enns claims), then apparently the commands against murder aren’t so clear after all. In the end, Enns’s approach to this entire issue is grandly confused. For one who claims the moral high ground in objecting to Scripture, he’ll need to come up with some better answers. For one who claims the moral high ground in objecting to Scripture, he’ll need to come up with some better answers. (2) A second observation is about the way Enns dismisses the internal biblical logic for why God is justified in judging people. For instance, he could’ve given more weight to the fact that Scripture makes it plain that due to both original and actual sins, God is entirely justified in judging anyone (not just Canaanites). Romans 1 makes it clear there are no innocent people, and Romans 5 makes it clear all are guilty for Adam’s sin. God owes life to no one. So if he decides to execute his judgment on earth, whether through natural disasters or human armies, how is that a violation of any moral law? Add to this the fact that the Canaanites were a very wicked people group. Enns is correct that other groups were equally wicked (if not more so). But why is God obligated to judge everyone simultaneously? Enns makes it seems as if it must be an all-or-nothing approach with God. Either he must judge all or save all—and at the same moment. In Romans 9, though, Paul makes it quite clear that God can show mercy to some and bring judgment to others. Moreover, Jesus makes virtually the opposite point Enns does when he’s asked why the tower of Siloam fell and killed a bunch of people. Jesus replied, “Do you think that they were worse offenders than all the others who lived in Jerusalem? No, I tell you. But unless you repent, you will all likewise perish” (Luke 13:4–5). In other words, these people didn’t have to be the worst of sinners to justifiably receive God’s judgment—and on that basis, Jesus warns others about their coming judgment! I suppose Enns might balk at Paul’s teaching on sin and election—he may even say Jesus is simply wrong about the tower of Siloam (or that Jesus never really said this). But, of course, that would just reveal the utterly circular nature of Enns’s position. He can only say the Bible has no explanation for things like the Canaanite conquest if he gets to choose the passages he thinks are genuine in the first place. The perfect example of this sort of move is the way Enns addresses the topic of hell. Arguably, if God is morally justified to send people to hell forever (even the nice non-Christian lady next door who seems “good”), he’s morally justified to enact the Canaanite conquest. If you object to the conquest, you’d have to object to hell. Enns conveniently sidesteps this whole argument by simply denying the reality of hell—at least any recognizable historic Christian view of it. Of course, such a move is monumental. Enns basically rewrites the entire history of Christianity on this doctrine, yet glosses over it like it’s no big deal (and with virtually no exegetical discussion of key texts). The reader senses that this all works out a little too neatly for Enns. Can he really take the major hole in his argument, the reality of hell, and dismiss it with a wave of the hand? This also raises issues later regarding Enns’s belief that Jesus died on the cross to save us. If there is no hell, what exactly was Jesus saving us from? (3) A third concern with Enns’s approach to the Canaanite conquest is its implications for our view of Scripture. His position isn’t just that the Bible gives an incomplete picture of God, or a limited picture, or a picture from just one perspective. Enns’s position is that the Bible gives a picture of God that is the exact opposite of how he actually is. Indeed, according to Enns, the Bible portrays God as a diabolical, genocidal, maniac. It portrays God as reprehensibly immoral and sinful. Thus, he claims, the OT God is portrayed more like Satan than like the real God. With that reality in mind, Enns’s insistence that we can still consider the OT to be the “Word of God” rings a bit hollow. Enns’s position is that the Bible gives a picture of God that is the exact opposite of how he actually is. I suppose Enns might respond by saying no one really believed this OT picture of God—everyone saw right through it and knew it was just a literary device. But that simply isn’t the case. It is clear that first-century Jews viewed the Canaanite conquest as real history. And it’s clear that, as a whole, Christians viewed the Canaanite conquest as something that actually happened. If Enns is right, then, it’s only now—in the modern day, with the help of critical scholarship—that we can finally see what Scripture really means. And it turns out that it means the opposite of what Christians (and Jews) have understood it to mean for thousands of years. There’s actually an early Christian position that was similar to Enns’s. Some early believers were repulsed by the fiery judgment of the God portrayed in the OT and they, like Enns, decided this God couldn’t be the real God. That group was the Marcionites. Marcion—an influential second-century Christian in Rome—believed the wrathful God of the OT was really a false god (a demiurge) who couldn’t be squared with the person and ministry of Jesus. Although Enns’s position is not exactly like Marcion’s (they are different in a number of ways), the similarities are striking. In chapter three, Enns dives into the historicity of the biblical accounts, both old and new. He reminds us the biblical authors “shape” their stories to make a point—they are “not objective observers and don’t pretend to be” (75). And they did so for a reason, namely to address the issues God’s people were facing in the present. Enns is absolutely correct about this point. We shouldn’t have a view of ancient historical accounts in which we naïvely assume they did history like we would today. In the ancient world, historians would often “decide what to include, what order to put things in, how to compress or combine scenes to save time and get the money shot, and so on” (75). So far, so good. As might be expected, however, Enns goes much further than just correcting modernistic expectations about history. He argues that many of the historical accounts are just “invented” (76), “contradict each other” (76), and engage in “creative writing” (80) and even “myth” (119). The Gospel stories conflict all over the place—from Christ’s birth to his resurrection. Matthew made up the story of the star over the manger (83). He also made up Herod’s massacre of children (84). Luke may have invented the story of the angelic choir at Jesus’s birth (85). The virgin birth may have resulted from Matthew and Luke being “innovators” (82). Matthew “created” the story that Roman soldiers were asked to guard the tomb (87). Samuel/Kings contradicts Chronicles regarding Israel’s monarchy; they “tell two irreconcilably different stories of Israel’s founding kings” (96). The Exodus event never happened; it was probably just a “few hundred” slaves who left Egypt and made their way to Canaan (118). The ten plagues never happened either, but were crafted as a story to challenge Egyptian gods. The flood is a myth, too, as is the creation account itself. Sure, they’re probably rooted in some real events, but the stories as we have them are all reworked to tell Israel’s story. Thus, Enns concludes, “‘Storytelling’ is a better way of understanding what the Bible is doing with the past than ‘history writing’” (128). Again, it’s difficult in a single book review to know what to do with a laundry list of claims like this. As noted above, none of Enns’s critiques of the biblical stories is new—they’ve been noted by orthodox Christians for generations (in some instances since the very first centuries of the church). And since evangelicals have provided extensive discussions of such issues in other places, there’s no need (nor space) to address each here. What's noteworthy is that Enns interacts with hardly any evangelical responses to these issues. It’s almost like they don’t exist. There are two sides to every issue he raises, yet he seems intent on giving the reader the impression there’s only one. Of course, this approach is rather ironic since it appears in a book where Enns is calling his audience to break out of their narrow view of the Bible and “wrestle” with different perspectives and approaches. But what’s particularly stunning is that Enns seems to forget his own view of Scripture when he gets to the chapter six, the final section, and begins discussing Jesus. At one point he states confidently and without qualification: “Jesus was crucified on Good Friday and raised from the dead on the third day, on Easter Sunday” (196). But how does he know this? If the Gospel authors shaped, reshaped, embellished, and often created stories from scratch—as Enns spent all of chapter three arguing—then why would he think this part is any different? Why is he now suddenly certain Jesus died on a Friday and rose on a Sunday? Why think Jesus rose at all? Perhaps the story has been modified to meet readers’ expectations. Maybe it’s been reshaped to address the needs of the audience. Maybe the resurrection is just a story that helps Christians remember that their god is “alive” and better than other gods. After all, we must remember what Enns told us earlier—that it is a “wrongheaded premise” to assume Scripture has to “get history ‘right’” (128). Enns’s newfound certainty doesn’t stop there. Throughout chapter six he often refers to the actions and teachings of Jesus without any qualification about whether these things really happened or were said. Indeed, when it comes to the passages he uses to formulate his own interpretation of Jesus, he seems much less concerned to challenge their historicity. Indeed, when it comes to the passages he uses to formulate his own interpretation of Jesus, he seems much less concerned to challenge their historicity. In response, I suppose Enns could argue that standard historical-critical methodologies can be used to reach some relatively certain conclusions about what “actually” happened in the Gospels, such as Jesus’s death and resurrection. But elsewhere Enns insisted that “to ferret out what may or may not have ‘actually’ happened . . . is not only a completely unreasonable quest, but also misses the point” (85). In addition, he admits, “Judging where history ends and creative writing begins is tough, and biblical scholars go back and forth on all that” (80). If that’s the case, then how is he suddenly so sure about all these historical facts about Jesus? It’s not like historical-critical methods would ever conclude the resurrection is historical fact. This is the ultimate example of creatively reshaping a story, modern scholars say. It’s disingenuous for Enns to unapologetically use critical methodology to expose the historical problems with every other biblical story, but then carve out a special exception to this one. And there is another problem for Enns’s take on biblical historicity: his view is entirely out of sync with almost all ancient approaches to the Bible. Take, for example, the Exodus event he says didn’t happen. Did first-century Jews think it really happened? Yes. Did the New Testament (NT) authors think so, too? Yes. Did Jesus himself think the Exodus happened? Yes. Did the earliest Christians think the same? Yes. Nevertheless, Enns claims, it’s not until the advent of modern archaeology that we know what really happened (or at least what didn’t). This raises an obvious question: If Enns’s approach is the genuinely ancient way of reading the Bible (as he repeatedly claims), then why did no ancient people read the Bible this way? Enns insists that only he is letting the Bible be the Bible. The careful reader is not so sure. Enns spends much time critiquing the historicity of Scripture, but he doesn’t stop there. He go after its ethics, too. The Bible is not an “instruction manual,” he insists. “Waiting for the Bible to ‘tell me what to do’ means we’ll . . . be waiting forever” (134, 135). Enns then plunges into a lengthy discussion of the incoherence of the OT's moral exhortations, particularly in Proverbs, Job, and Ecclesiastes. Moreover, he argues, the laws given to Israel are contradictory and inconsistent. But again, Enns’s insistence that the Bible cannot provide coherent moral guidance presents a number of problems for his own position. If it doesn’t provide moral guidance, then why do the NT authors—and Jesus himself—repeatedly treat it as a source for moral guidance? For example, Jesus appeals to the supposedly fictitious story of Adam and Eve and draws moral lessons from it about divorce and adultery (Matt. 19:3–9). Not only did Jesus think this story was real (contra Enns), he thought it provided clear moral guidance (contra Enns). Paul tells us Scripture is profitable for “training in righteousness, that the man of God may be competent, equipped for every good work” (2 Tim. 3:16–17). It sure sounds like the apostle thought the OT was able to provide clear moral guidance. On top of all of this, if Enns thinks the OT isn’t able to provide clear moral instruction, then on what grounds does he declare “sin [is] disobedience to God and unjust actions toward others” (217)? How can sin be disobedience to God if it’s unclear what he’s commanded? How can sin be unjust actions toward others if we have no idea what counts as an unjust action? Enns wants to be able to say we need Jesus since God holds us accountable for sins, but his own beliefs about Scripture’s moral laws (i.e., that they’re contradictory and unclear) undercut the very possibility that God could hold us accountable for sin. How could God hold us accountable for what is not clear? I confess I have no idea what any of this means. When it comes to critiquing God’s Word, Enns is clear. But when it comes to describing his own positive view, he’s vague. Words like journey and discovery and wrestling pop up a good bit, but it’s hard to understand exactly what he’s positively claiming for the Bible. One gets the impression that perhaps Enns wants to keep things vague. After all, Scripture is not an objective thing; it’s whatever we make it. As he writes, “We’re all free to put the pieces together as we think best” (86). In the end, The Bible Tells Me So is a book about contradictions. Enns intended it to be a book about contradictions in the Bible. But it becomes quickly apparent that the contradictions are really in Enns’s own worldview. He claims the Canaanite conquest is immoral, yet argues the Bible provides no clear guide for morality. He claims the Bible presents a diabolical genocidal God, yet insists we still “meet God in its pages” (3). He argues Scripture is filled with reworked stories, many of which are made up entirely, yet seems to know which ones really happened and which did not. He claims the Bible provides no clear moral instruction, yet says people are “disobedient” to God and in need of the cross. He claims he’s the one reading the Bible in an ancient manner when, in fact, people in the ancient world didn’t read it the way he does. For all these reasons, Enns comes across as a man divided. By the end of the book, one senses he’s trying to live in two worlds at once. Such a scenario is ironic in a book purportedly trying to help those who are “holding on tooth and nail to something that’s not working, denying that nagging undercurrent of tension” (7). One wonders if Enns is describing others or whether he is really describing himself.